December is here! Do you guys like the snowy windows and shutters on the blog header? No more Autumn leaves, it's time to make room for some snow! There have been so many awesome photos of Thanksgiving feasts on blogland these past few days! Us food bloggers are a well-fed bunch, that's for sure. We had a Thanksgiving for two, so I only had to make dessert for two. What to make? Decisions, decisions. Pumpkin? Nah, I'm all pumpkined out. Apples? Mmmmaybe. But what? Apple pie? Meh. Apple galettes? Not creamy enough. Apple cream tarts? Sounds like a winner! These little tarts were delicious, but so very unphotogenic. It is mandatory to watch a FRIENDS Thanksgiving marathon on Thanksgiving day. So I gathered my ingredients and utensils while I watched my favorite episode ever (Thanksgiving or not), which is "The one where Ross got high". In this episode, Rachel tries to make a traditional English trifle, but ends up failing miserably when she adds beef, peas and onions to the dessert. This episode is full of buffoonery to the extreme! "I wasn't supposed to put beef in the trifle!" OK, now that that's out of the way, let's get serious... ish. 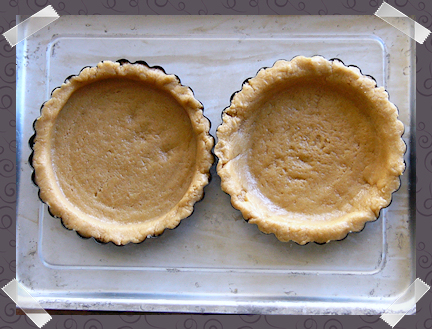 Preheat the oven to 375 degrees and spray two four-inch mini tart pans with cooking spray. 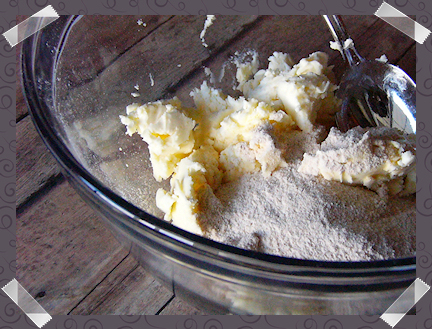 In a medium bowl, cream the margarine and the sugar with an electric mixer for about one minute. I used turbinado sugar that I ground to a fine powder in the Magic Bullet. If you're using plain white sugar you don't have to worry about grinding it, and you don't have to grind your turbinado for this, I just like how much smoother it makes the dough. 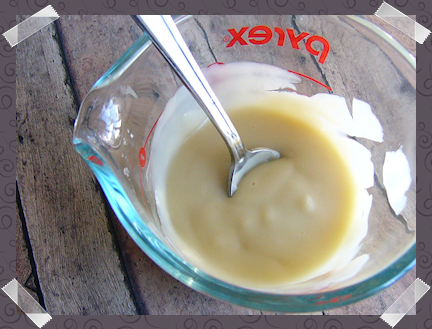 Add the almond extract and the water and mix for another minute until everything looks smooth and creamy. 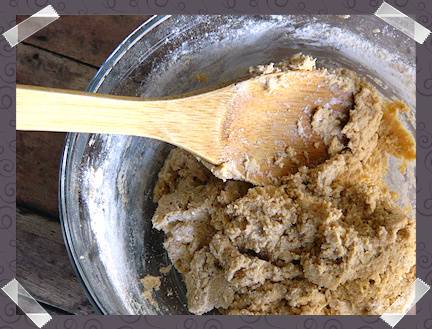 Stir in the flour using a wooden spoon. 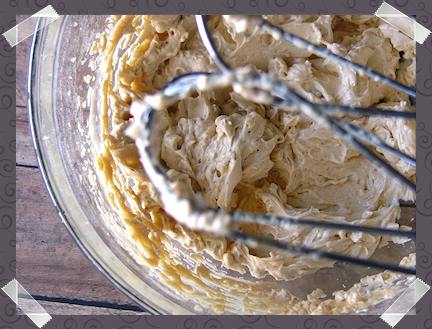 If the dough is too sticky you might have to add more flour, one tablespoon at a time until the dough is workable. Divide the dough in half and shape each half into a ball. Both balls should be about the same size (oh, har har!) I went all fancy pants and weighed each ball to make sure they weighed about the same. 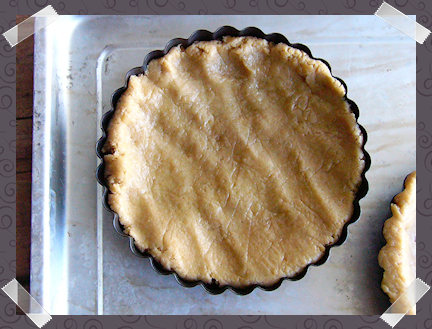 Place each ball in the middle of each mini tart pan and press down with your fingers to distribute the dough evenly on each pan. 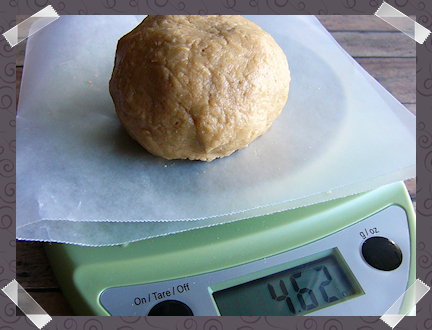 Use a large measuring cup or glass to press down the dough and form even-enough edges all around. You could just do this with your fingertips, but what fun is that? Now that we're done with the dough, take the crust-to-be to the fridge and lets move on to the cream filling. I don't like to make custards on the stove top-that's what the microwave is for! If you want to make a tiny custard in a tiny saucepan on the stove top go for it though. That's just too much work and too many dirty dishes for my taste. In a glass measuring jar, combine the cornstarch and a little bit of milk (about two tablespoons) and stir until the cornstarch dissolves completely. Stir in the rest of the milk and microwave for 30 seconds. Take the jar out and stir. Microwave for 30 seconds. Take the jar out and stir (it should be starting to thicken at this point). Microwave for 15 seconds. Take the jar out and stir and microwave for 15 more seconds. It should have thickened into a lovely custardy puddingy cream at this point. If it didn't, nuke it for 15 more seconds. Now that the custardy puddingy cream has thickened, let's add the goodies! Stir in the maple syrup and vanilla until it's creamy again. It will look a little chunky-monkey while you're stirring it at first, but it will get smoother in a few seconds. 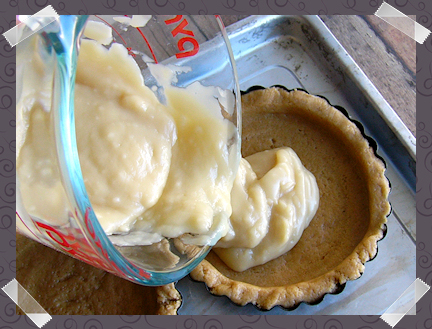 Pour about half of the custardy puddingy cream into each crust. Unless you have three hands and you've been stirring it constantly it will look a little lumpy, but it won't taste lumpy when the tarts are done. Use a spoon to spread the cream filling evenly. Take them back to the fridge and let's peel some apples! 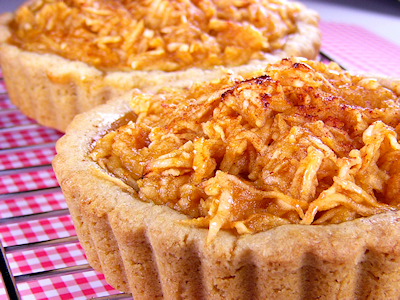 Here's the thing, if you want a thin layer of shredded apples, then you only need one. You should probably reduce the amount of maple syrup to 1/2 tablespoon too. If you want a thick layer then you will need two apples. I went with two apples for maximum appley goodness! Peel and shred the apples. I don't know about you, but I hate shredding things by hand! My food processor took care of that chore for me. Isn't he nice? 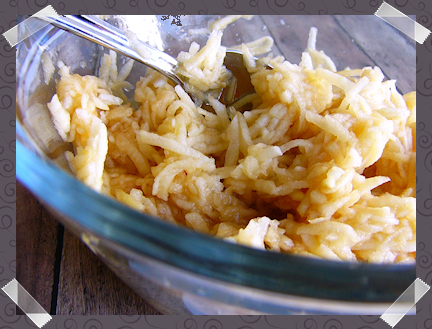 Transfer the shredded apples to a mixing bowl and drizzle the maple syrup over them. 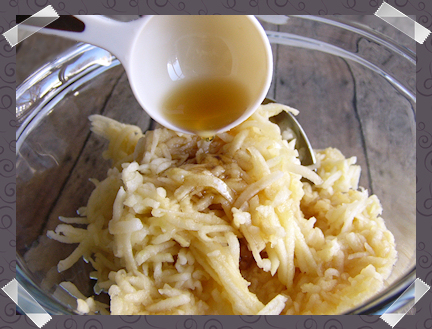 Use a fork or a spoon to move the shreds around and coat them evenly with the syrup. Spoon the apple mix on top of each tart and sprinkle some magic cinnamon all over the appley goodness. Bake them at 375 degrees for 30 to 40 minutes or until the crusts are golden brown and the apples are cooked. The crust should expand a little bit and it should be a little higher than the edges of the pan. 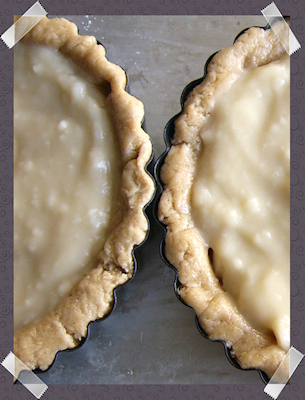 Let the tarts cool down a bit for about ten minutes and then carefully transfer them to a cooling rack. 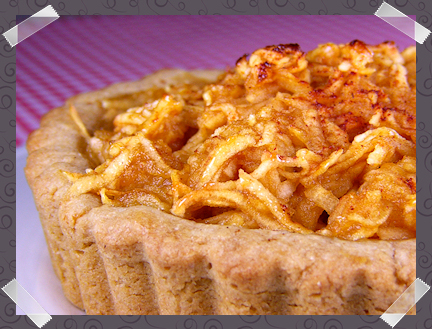 The flavors of the almond extract, the maple syrup, the apples and the cinnamon work wonderfully together. My favorite way to eat them is while they're still barely warm and all gooey, and I keep the cinnamon handy in case I want an extra dash or two on top. I hope you enjoyed this step-by-step recipe! Would you like to see more posts like this? I had lots of fun photographing each step, too bad the finished tarts were acting like total divas and refused to be very photogenic. Fun celebration and gorgeous treat! Apple cream tarts sound scrummy!! I am a terrible baker, but I may just have to try these. Those apple cream tarts look amazing! 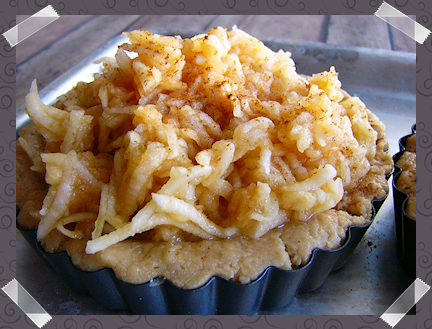 I love the custardy filling with the apple strussel on top--perfect for warming up on a chilly winter night. Sigh. 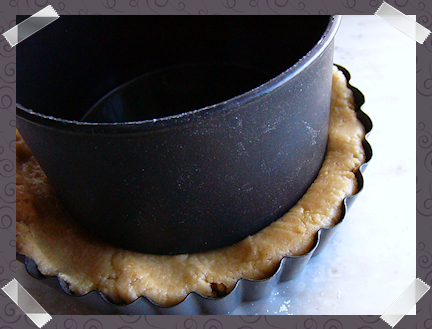 I suppose now I need some mini tart pans because I have to make some custardy tarts. I'm going to try it for sure! And the thorough step by step pictures and instructions are a winner! I'd be happy to see more of those in future (if I took step by step picures of my baking adventures you would see me not measuring anything accurately, using all the wrong pans/utensils in a bid to save on washing up, then disappearing in a cloud of flour, then burning myself, then despairing because mine didn't look like the one in the book! Tee hee!). You're expecting snow today? You're SO lucky! Wish I was there! Monica: "Beef in a dessert!?" Joey: "I know! And only one layer of jam?! What is up with that? I need to get a TV in my kitchen! Or maybe not, I'm too easily distracted already, I don't need any more kitchen *FAILS* (or splattered food on the telly!). No snow here! But shh, don't say anything to provoke it! I never had any kind of cream pie but this one sounds delicious! Those look great! I'm definitely bookmarking the recipe. It hasn't snowed here yet and I'm getting really impatient. Everyone thinks I'm crazy for actually wanting snow, but for me it just isn't the holidays without it! Jes - Thank you! They are so meant to be eaten on a chilly winter night! Lisa - They are very easy to make, so I say go for it! Andrea - I will take mini tarts over a big tart any day! But you could make one big tart using this recipe too, it would probably work just fine in a round 9 inch pie pan. Ross: Monica and Chandler are living together! Monica: Ross married Rachel in Vegas! And got divorced! Again!! Phoebe: I love Jacques Cousteau! Rachel: I wasn’t supposed to put beef in the trifle! Gala - Thank you! I am a cream pie freak (and so is Mr. Kook! ), so whenever there is something to celebrate, we celebrate with some sort of cream pie! I can't tell you how incredible that tart looks! I love that you grated the apples. I'm crazy for apples so I HAVE to bookmark this recipe. I'll just admire the snow on your header. I'm more of a summertime beach lover. Aw, River, what an awesome post! And your new header is very cute. i love the wintery blog header, River! hoooooray! 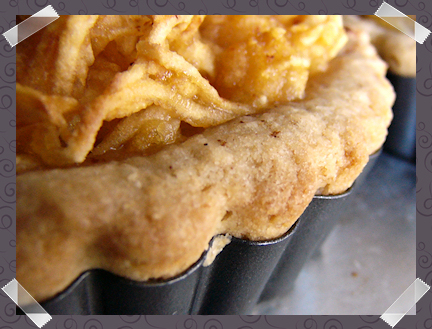 you are just too awesome, River – your apple cream tarts look lovely & absolutely amazing! thanks for the pictures of the process as well. 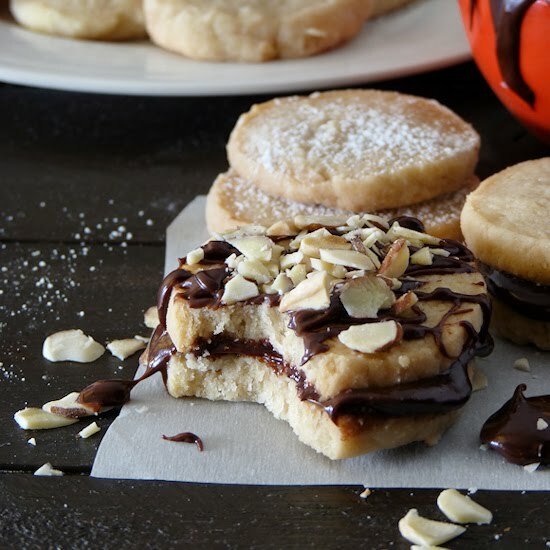 i’m totally going to have to create a gluten-free version so i can enjoy these yummies! mmmmmmmmmm! it's not snowing here yet, but it should start a little on saturday. hooray! Oh these look like the PERFECT pudding for me and I am licking my lips as I type. Yummy yummy indeed. Okay apple cream tarts and a Friends marathon...I like the way you live, sistah! Mmmm, creamy filling and apples. I never would have thought of shredding the apples. You are so clever. We had our first snow last night - only about a half inch, but the kids are excited! It looks fantastic and nomtastic and I want it in my belleh right now! Mihl - Thank you! I'm glad you like the header, now we both have snowy blogs! Jessica - Whee!! Another Gilmore Girls fan to add to my recruiting list! Isn't that show the best ever?! Jessy - Thank you! Let me know how your gluten-free version goes! YAY for snow! We did end up having a few flakes, but it didn't accumulate. Susan G - Thank you! I am not really clever though, just lazy! It was easier to let the food processor shred the apples than to slice them by hand! YAY for at least a little bit of snow! What do you mean unphotogenic? They sure look good to me! I love apple desserts, this recipe is totally getting bookmarked. I'm getting a little pumpkined out too, I overdid it a little. I often wish I had a tv in the kitchen so I could watch my favourite shows while I cook... but I would probably make mistakes! MMMMMMMMM,...what divine tartlets!! I so love all of your used flavours! Yum! I also love the step by step! Thanks!! You make those tarts look so easy! I love anything with fall flavors, and easy is my middle name! Sophie - Thank you! I'm glad you like the step by step! It was fun documenting everything! Pie crust is easy, you just have to embrace it. Took me a few tries, but I finally got my groove on with them. And my how this reminds me of someone I know, who goes by the name of 'River'?! The squirell photos are to die for. 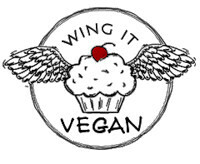 Glad you are doing OK over here, but I openly admit to missing Wing It. Be well and hope you have a grand holiday!